Like most of the midwest, we were hit by a severe winter storm this week. According to the National Weather Service, our total snowfall was 13.5″ with winds reaching 44 mph. My relatives in Michigan call us wimps. That amount of snow is nothing. I have to agree with them. The people around here are wimps. I like snow. In particular, I enjoy going out in the evening and shoveling the driveway. 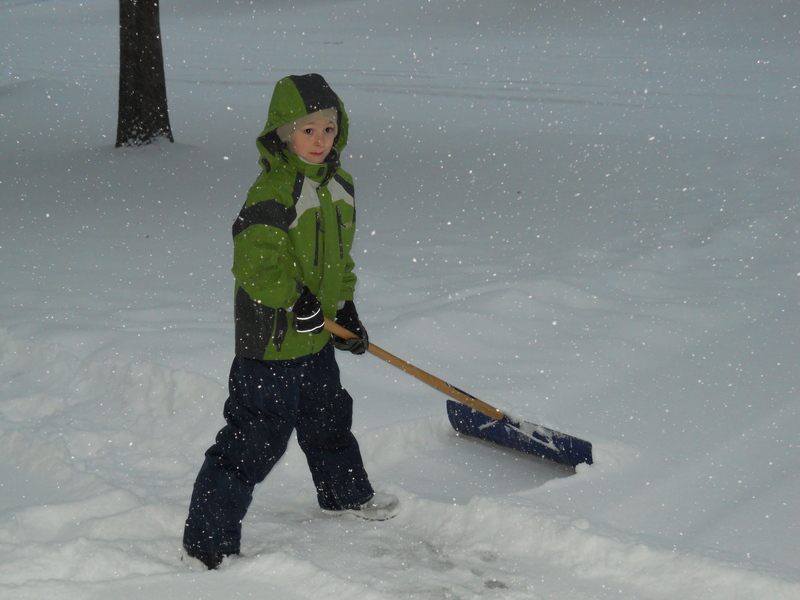 I know that may sound nuts…someone actually likes to shovel? I do enjoy it for a couple of reasons. First, I enjoy the sense of accomplishment. I took a Gallup assessment a few years ago that identifies your talent themes. One of my top five was ‘Achiever.’ In a nutshell, it means I like to be able to cross things off my to-do list. Shoveling the driveway lets me realize one of my talents. I enjoy looking at the cleaned driveway and recognizing that I accomplished my goal (even if that goal was only to be able to get the minivans out of the garage). Second, I love the sound of a new snowfall. Or more specific, the absence of sound. Freshly fallen snow absorbs the sounds of our neighborhood. If you haven’t tried it before, I recommend standing outside after a snowfall and just listen. Passing cars don’t seem as loud. The wind whistling through the trees is the only steady sound. Standing out in the driveway, I’m able to lose all distractions and find some peace and quiet. Peace and Quiet. With the heavy snowfall come snow days. Which means the kids aren’t in school. Which means they are at home with me. They are loud. It’s quite possible that the insulating effect the snow has outside causes the sound waves to be reflected back inside the house. Did I mention they are loud? They’ve had three snow days so far this week and there is no school tomorrow for what they call a ‘professional day.’ I’m pretty sure professional days are just breaks they create so teachers don’t lose their sanity during the school year and snap on some unsuspecting 4th grader. But when it comes on the heels of three snow days, they’re really only torturing the parents. Oh, and next week is Parent-Teacher conferences, which means there are two more days that they won’t be in school. I tried to get them to go outside to help shovel the driveway, but all they want to do is play. Seriously, isn’t the reason I had kids was so the amount of work I had to do (shoveling, mowing, dishes, laundry, etc) would decrease? That’s one return on investment I have yet to see. Instead, they insist on playing, arguing about how the other is playing, wrestling, arguing about how the other hurt them while wrestling…you get the idea. Maybe I’ll just go back outside and shovel the neighbor’s driveway. I do notice and look forward to how quiet it is after a snow. Loved you post!